I am tickled pink to be part of the Abstract Garden frenzy with Benartex! Because Holy Yummy Colorful Goodness! Also? How cool is it that this is happening Valentine’s week and the Benartex blog is called Sew in Love with Fabric? When Christa told me her inspiration for designing Abstract Garden was so that she could get something to grow, I knew I had to create a flower explosion to show off just how much it could! And with her retro vibe it had to be a garden of yo-yos! Meet Mod Garden! Christa’s unique sense of clean graphics and rich, bright, saturated colors just makes me happy. Super cheerful, every time. 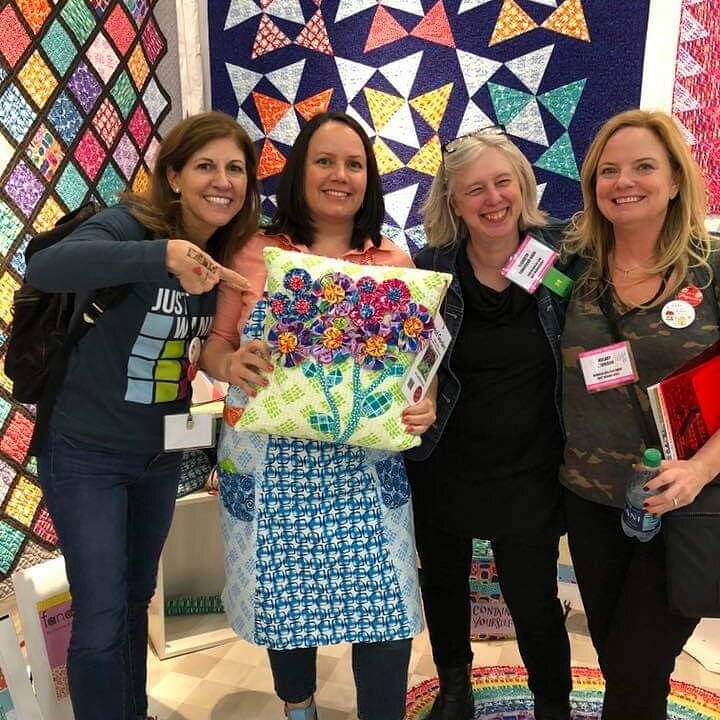 This fun little pillow went all the way to Houston and hung out with Christa in the Benartex booth for Fall Quilt Market 2018. I wasn’t there, but some friends swung by to get a glamour shot. If you’ve never made yo-yos before, get ready to fall in love with one of the easiest, most portable sewing projects possible. Wanna make your own Mod Garden? Check out the photo-illustrated tutorial! And because this post drops on Valentine’s Day, and I had a little more fabric leftover… I had to make something with hearts out of Abstract Garden, too, didn’t I?!? Meet the Heart Happy pillow! Here’s a photo-illustrated tutorial for making your own Heart Happy! I love picking winners! Benartex is generously offering a bundle of 8-10 fat quarters of Abstract Garden! This giveaway is open to US residents only. To enter, please leave a comment below answering this simple question no later than noon (EST) Sunday, Feb 17th. I’ll pick a winner using a random number generator and announce the winner Sunday night. Abstract Garden Blog Hop & Giveaway Today! Irises are my favorite flower because we have such gorgeous varieties down here in the Louisiana swamps. I’ve even gotten my husband to help me dig up tubers of native rust irises from the ditch along side a swamp nearby. Of course we wore rubber boots scare away snakes & alligators! Rose are my fav! 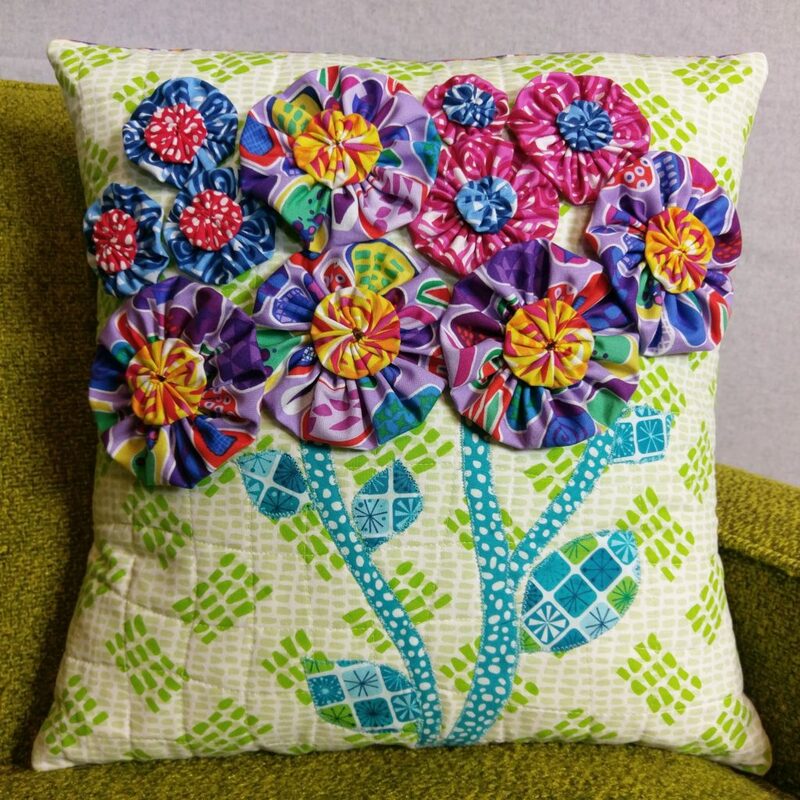 Love the flower pillow – amazing texture!! I’m not sure how to spell ronunculos, so I will just say Iris is my favorite flower. Thank you for the chance to win this beautiful fabric! Gimme a flower, any flower. I used to grow roses but the deer eat them to nubs where I live now. So, I guess my favorite flower would be one of the few deer won’t eat. And that Churn Dash. Wow! At his time of the year, it’s lilacs. I’m waiting for the lovely soft fragrant blooms that signal spring here in central California. Tulips. I planted a tulip garden at my last home with dozens of varieties of tulips. I wonder if the new owners kept that beautiful garden. LoVe your pillows and the dimensional aspect is so sweet! Christa’s collection is so perfect for so many projects…I’d love to create with it! My favorite flower is the daffodil. It’s one of the first spring flowers and so delicate. Love the bright, wonderful colors of this collection! What a great group of makes! Favorite flower – Daisy! Love the bright, wonderful colors of this collection! What a happy group of makes! Favorite flower – Daisy! I love Bird of Paradise flowers. I saw them in photos (and quilt patterns!) for years and admired them, and then recently saw them growing ” in person” in California. What a thrill! 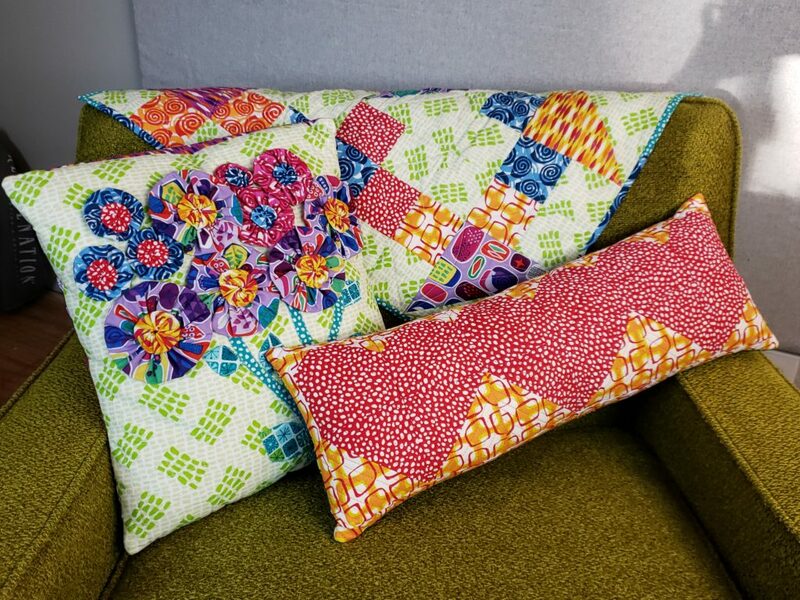 I love your projects with this fabric line, especially that pillow. Thanks for sharing the tutorial. I’m going to make one! My favorite flower would be the Tulip! Lovely projects! My favorite flower is the daisy! I don’t think I have a favorite flower, but I do love the color they bring to a yard. I like to have a variety so that I always have flowers to enjoy. I love the yo yo flowers on the pillow. My favorite flower is the sunflower. I like so many flowers, the daisy is probably my favorite. I love to grow zinnias. Such bright colors, just like this fabric. I’m one of the many, many people who will say roses. They remind me of gardening with my mother in her garden and I love them now in my own garden. They make me so happy. Wow, all your projects would look so nice in my daughter’s mid-century modern living room! My favorite flower is tulips. Thanks for the opportunity to win! My favorite flower is the peony. So big and so beautiful! My favorite flower is the hydrangea. My favorite flower/plant has to be Brunnera Jack Frost! Oh geez…there are so many…I guess Butterfly Weed because Monarch butterflies are attracted to it and lay their eggs on it. I love watching the caterpillars grow, turn to chrysalis and burst out as beautiful butterflies. Love the flowers! Roses are my favorite flower. Oh your projects are wonderful! I love the yo-yo’s. Haven’t thought of making those in years but your pillow is really charming! I love roses. My dad used to have a whole garden of them as a kid and I never get tired of them. Thanks for sharing the chance at the great giveaway! And Happy Valentines day to you. Sunflowers and dahlias are my favorite! My favorite flower is “all of them”–I can’t pick a favorite–but I do love the beautiful deep blue of a morning glory . Any flower, but daisies. Particularly wild daisies that you see on the side of a road. Gorgeous! I really like carnations. Love your yo-yo flowers. My favorite flower is the Gerber Daisy. I have two favorite flowers: daffodils and lilacs. I think Gerbera daisies are just lovely. One year I grew some really pretty orange ones and I took lots of photos of them. Now I have some of the photos framed and hanging on the wall so I can see them every day. Coneflower! Wouldn’t a quilt of these flowers look fabulous in your luscious fabrics?!! You’re the winner of the fat quarter bundle, Barbara!! I’ll send you an email. Woohoo! I love marigolds, especially the 6-8 in varieties. These happy fun fabrics just don’t stop!!! Love them. Favorite flower…DAISY, so simple and happy. Iris, and zinnia, and sunflower, and azalea, and pretty much all the rest! My fav is calla lilies. I have pink ones that bloom in my garden every year and just make me happy. I love the Garden Yo Yo pillow. Wonderful. I’m not “in to” flowers due to seasonal allergies. My garden contains, herbs, lemon tree, Granny Smith apple tree, and rhubarb. My daughter loves red roses, but they are “picky.” My Dad had a great Rose Garden, but I like to concentrate my time by making clothes, books, toys for my 20 month old granddaughter. My favorite flowers are violets. Red roses climbing by our front door! Reminds me of my mother who died young from great cancer. My favorite flower is the rose. My favorite flower is the cattleya orchid but I love your yo yo’s! My current favorite flower is the Japanese iris. Oh my goodness what a traveling pillow in Abstract Garden! I hope Tara, that you’re enjoying it at home now:) Churn it UP!! My fav flower is the red rose for its beauty and fragrance. I’m a gardener as well as a quilter, so choosing my favorite flower is difficult. It is probably tea roses. Unfortunately, they are also the favorites of our local deer population. Still, the ones I get before they’re eaten are beautiful. 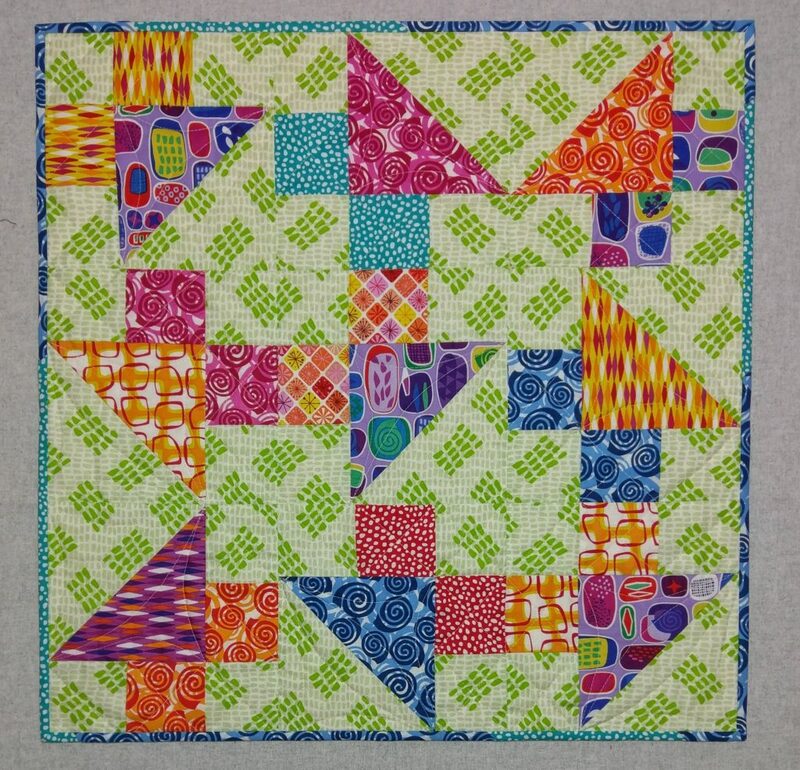 I love your happy, cheerful quilts. Thank you for sharing. I love all perennials because I don’t have to plant them each year. One of my favorites is the Purple Coneflower. Thanks for the giveaway. Hi! 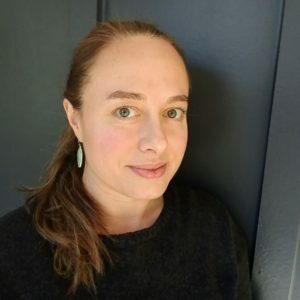 I’m Tara Miller and I’m so glad you’re here! 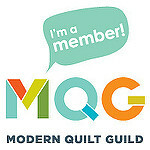 I’m a designer, maker, and rookie quilt historian. 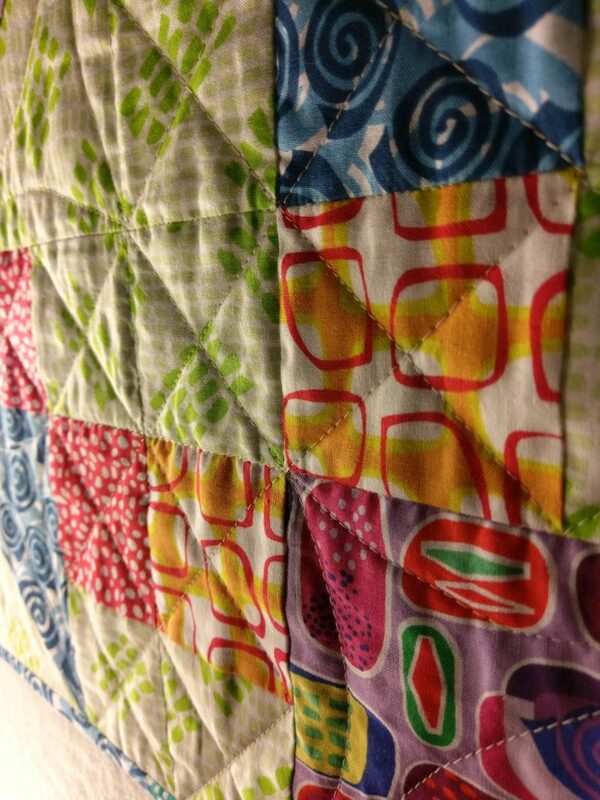 Quilts are my passion.